I'm very pleased to announce the availability of FeedDemon 3.1. Despite the minor version change, this is a significant release – there are some major new features which I think you're going to love. If you're in a hurry and don't want to read the rest of this post, you can check out the release notes for details on what's new, or you can skip all that and simply download FeedDemon 3.1 right now. My favorite new feature is "Shared by People I Follow." If you're following people in Google Reader, their shared items now appear in FeedDemon, and as I mentioned in my previous post, these shared items are included when finding and suggesting popular items. I've found this to be a great way to uncover interesting articles in feeds I'm not subscribed to. When an article has been shared by someone, their profile photo appears next to it so you can easily identify who shared it. To view posts shared by a specific person, just click their photo. 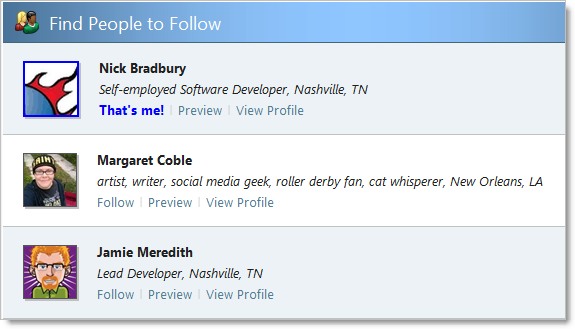 Click "Preview" to view a newspaper containing recently shared items from that person, or just click "Follow" to follow them right away. 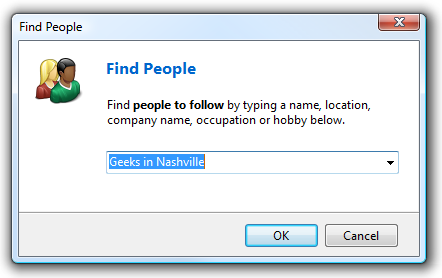 If you get tired of someone, select "Show People I Follow" and click "Unfollow" to stop following them. In the past you were forced to see every article from every feed you're subscribed to, but now you can use FeedDemon 3.1's "Content Filters" to hide the stuff you don't care about. Just create a content filter, assign it to whichever feeds you like, and articles in those feeds matching the filter will be marked read as soon as they arrive so you don't see them. 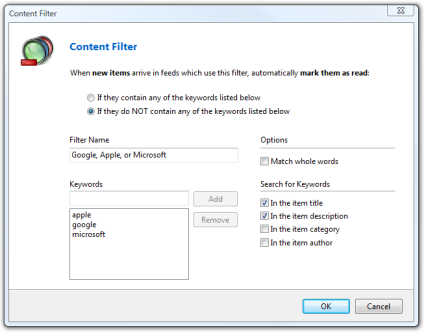 Content filters can be used to either include or exclude articles based on your keywords – and if you subscribe to a feed which has several different authors, you can use a content filter to show or hide articles from specific authors. I personally use this feature to deal with all the high-traffic tech feeds I'm subscribed to which rarely talk about things I care about. Now instead of seeing every single article, I have a content filter which automatically hides stuff that doesn't interest me. I'm subscribed to a lot of search feeds that tell me when someone blogs or tweets about FeedDemon, which really helps me stay in touch with how people feel about my work. Quite often I'll see something written in a different language, so I have to translate it in order to figure out what it says – a time-consuming process, especially when there are several items that need translating. FeedDemon 3.1 solves this with the addition of the "translate" icon which now appears beneath each item. Simply click this icon and FeedDemon will translate the item into your language. So that's a look at the major new features, but as with every release, there are tons of small improvements, changes and fixes in FeedDemon 3.1, all of which are covered in the release notes. PS: If you have any questions about the new version, rather than post a comment here, I recommend asking in the FeedDemon Support Group instead. The content filtering looks very useful. I really want to cut down on things that I see and this gives me a way to do that. I look forward to trying out the filtering. This looks great. However, one issue I have with FeedDemon that I wish was changed is the Back button in the upper toolbar. Say I am reading a folder (or feed) that has been paged due to having more than 25 items. I click Next Unread (in the upper toolbar) which moves it to Page 2 of N. I then realize I wanted to look at something again on Page 1, so I hit the back button (because it's near the Next Unread button). Instead of taking me to page 1, it takes me to the previous folder (or feed). This trips me up all the time. It would be nice if the back button worked at a finer grain page level, not just a feed/folder level. @Aaron: I wish I could say you're the first one to mention that, but I've heard several people ask for the browser history to support paging in the newspaper. I've held off making this change because it requires a pretty scary rewrite of some vital code, but it is something I need to do. In the meantime, though, you can always increase the number of items that appear on each page (Tools > Options > Reading) so that paging isn't as necessary. Update looks great Nick! Thanks. I have a small problem though in that I purchased FD3 however I seem to have deleted the order confirmation email with the activation key, would you be able to get in touch with me and help me sort this out? I am very pleased with the latest update. It is a "Back to the Future" version that provides both speed and the ability to really manage content. @Morgan: If you select Help > Purchase/Enter a Serial Number, the dialog that appears includes a "Lost your serial number" link - just click that to get your serial number sent to you. @Mark: By "saved posts," what are you referring to? Do you mean your unread items? Is it just me, or in Newspaper mode when selecting sort by Title, is it showing everything in reverse chronological order instead of alphabetically like the previous versions? I like the filters idea... in previous versions I was setting up watches for certain feeds to filter the stuff I didn't care about. Should be much more straightforward. I just wanted to thank you for the awesome tool. I only recently started using RSS feeds and love FeedDemon. I have a wide variety of interests and can't believe how much more information, more efficiently, I'm able to see every day. @Lancelot: Glad you like content filters! Sorting by date when grouped by title is a change in v3.10 - since grouping by title is often used for forum feeds, it just seemed to make sense to show the newest stuff first. @Mike, Khristopher, Ethan, Steve: Thanks - really glad to hear you like the new version! I love this new version. It genuinely seems much quicker than 3.0, especially when accessing "starred items" which previously would take 10-20 seconds to open. I'm still looking for my (potential) favourite feature - the ability to exclude a particular feed/folder from the "Panic button" mode. Some feeds I need to see, no matter how over-flowing my account is, and this stops me from ever using the "panic button" to clear down unimportant posts. @Nick: Great to hear that v3.1 is quicker for you! You can exclude folders from the "panic button" - just click Options on the panic button dialog, then enable the "Limit to specific folders" setting. @Nick, sorry, not posts that I've saved, but posts that I haven't trashed. Any post that was read just vanished, even posts posts prior to minutes before I updated. Thanks again for your ongoing work on FeedDemon, and in particular the migration to Google Reader sync, which made it just perfect. @Mark: My guess is that the posts weren't lost - they simply don't appear because FeedDemon defaults to showing only unread/starred items. You can view them again by changing the newspaper filter, which appears on the toolbar above FD's browser. Great stuff Nick! Thanks so much for addressing the newspaper printing issues. It's MUCH better now. The content filtering is great too. It looks like it's going to give you much more control than the watches do. Just a quick followup... I liked having the ability to switch between sorting by date and the title (alphabetically) in Newspaper view depending on the feed. I've got some feeds that have very similar yet not identical names. It was nice to have these grouped near each other when I wanted. With the change to the Title view sorting chronologically its essentially the same as sorting by the date now. Just my 2 cents for whatever its worth. @Greg: I've checked my code several times, and the only thing that might explain why you're seeing that error message is if your Internet Explorer "Favorites" folder is missing/invalid. The folder shown in the error message looks incorrect to me - I would think your favorites are located in C:\Users\Greg\Favorites instead. Does either folder exist? @Lancelot: I've had several people tell me that they didn't like that change, so I'm going to revert to the previous behavior in the next build. Absolutely trilled with update,one thing i would like to see is better Windows 7 support,like badges in superbar and some use of thumbnail preview. Yup! it is faster than before. 1. Add some more styles. Now I use "Expando" for most of the time, but I think it is a good area to focus on further development. I remember using the -view in browser- thing to read the feed long back. Now it seems to be inactive and only works for browser. Why is this? Will this be delivered through the FeedDemon update mechanism shortly? Many thanks for the updates to your superb software. While I think you did a good job, the review from CNet was not so kind. "FeedDemon remains one of the best desktop RSS and Atom feed catchers." It's sort of a kick in the gut to watch the video, but as Jack points out, it's hard to figure out how the same guy gave it a good review a few months ago. FWIW, I can certainly understand him being disappointed by the loss of NewsGator sync, and I know the transition to Google Reader wasn't a smooth one, but I do think the latest FeedDemon is far better than any version that synched with NG. I was sorry to see that Feeddemon made the list of worst applications on CNet. However, as pointed out here, it got rave reviews earlier in the year. I think you just have to keep moving forward. Time will tell if they (CNet) change their minds. Don't sweat it Nick. I found the cNet bashing sort of pointless considering that the only reason he dogged FD is because he was mad about the end of NG Online. He didn't even point to any issues with the program and what it actually does. FD is a great offering and MANY of us out here in the web-world will preach that far and wide. Thank you very much for another great update and I enjoy using FD every single day - i don't want to imagine to work as a journalist without it. Thanks, Tino - glad you like it. any advice on the code or method to blog directly from FeedDemon to Workpress. I have a blog on my site but I cannot get it to work. (PS. I did make a posting in the forum, however, I sense they are not sure what to do). Hey Nick, great work on the performance for the latest version. Its blindingly quick. I was contemplating dumping FD and going back to Google Reader in Chrome... but no more!! This is still the best reader on any platform.